Often taken for granted, the sink is one of the most important features of a kitchen. From doing dishes and prepping food to even bathing babies; what other home item is used for as many different tasks? 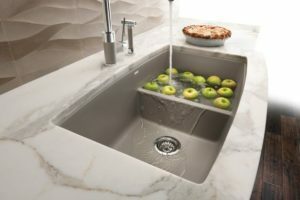 The kitchen sink has a long history – evolving from heavy pails and wash bins having to be filled from a nearby water source to the overwhelming number of types available today. 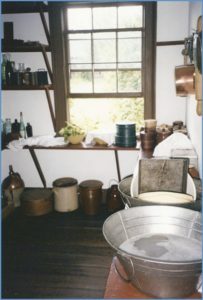 Two tin dishpans in use in an 1850’s kitchen. 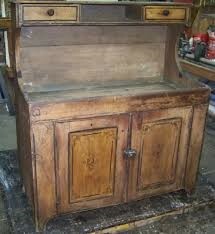 The centerpiece of early 20th century kitchens. Kohler Prolific sink with accessories. Below are some general features to consider. We hope this helps you begin to navigate the world of kitchen sinks! 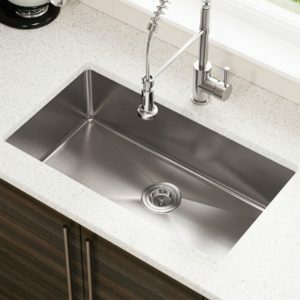 How many basins should your sink have and what type of configuration? A large, single kitchen sink. Pros: A kitchen sink with a single, deep basin means you can easily soak or wash a big pan or prep large quantities of food. Cons: Rinsing vegetables while soaking a large casserole dish requires a bit of juggling — as does hand washing and rinsing china or stemware. 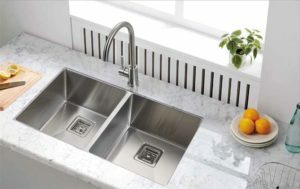 Two basins of differing sizes (a 60/40 or similar configuration of an offset sink). Pros: allows you to perform separate tasks, such as cleaning dishes and preparing food, with ease. 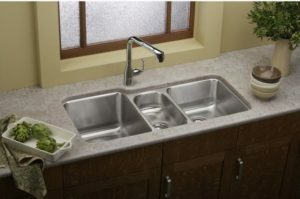 A 60/40 kitchen sink has one basin that is usually about 18 inches wide and another that is 14 inches wide. The idea is that you can clean up in the large basin and prep in the smaller one. Dual basins also come in handy when you are washing items you don’t want to put in the dishwasher (soap in one basin, rinse in the other). Cons: A smaller basin makes it harder to wash and soak large pans. 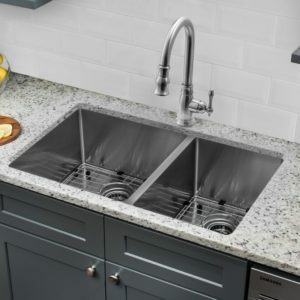 Pros: This type of kitchen sink is for people who love symmetry in design. It also has the benefit of allowing separate tasks (cleaning, prepping and washing, rinsing). Cons: That large pan could be soaking on the counter. Three basins (two large ones and one small one with a garbage disposal). Pros: You can use the garbage disposal independently of the sink. Cons: In some models, such as this one, you can’t sweep food scraps off the counter and into the disposal (this could be remedied with a cutting board insert). Because it is a wider sink, more space is needed. 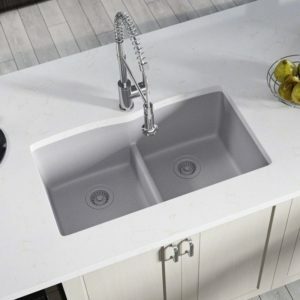 Would you prefer a larger basin but unable to give up a split sink? Pros: Want to have a double kitchen sink and be able to comfortably wash or soak a long-handled pan? A sink with a lowered divider might be for you. Cons: If your cooking style demands deep water, this is not an ideal configuration. What shape of sink would you prefer? 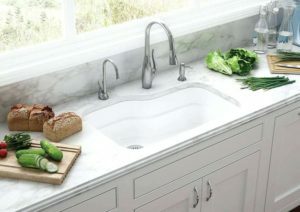 Pros: Many farmhouse sinks are simply single, large basins. The difference is their distinctive apron front, which has a vintage vibe many homeowners love. 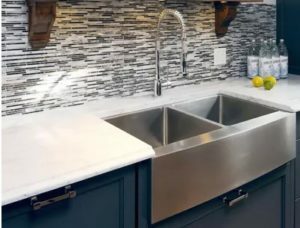 For a typical sink, the basin can be four inches away from the edge of the counter-top, but this sink can sit a bit beyond the counter line. 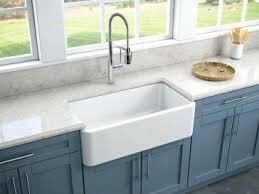 For people of shorter stature and kids, a farmhouse sink can be more accessible. If you choose a porcelain or ceramic farmhouse sink, there are a wealth of color options. 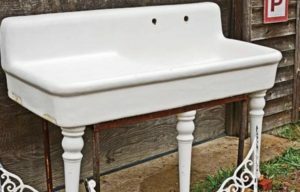 Cons: A farmhouse sink makes a deliberate design statement that will be with you for a long time — which is wonderful, unless your tastes change. Pros: Same benefits as any other double sink. Cons: It does not have the true vintage style of a single-basin farmhouse sink. 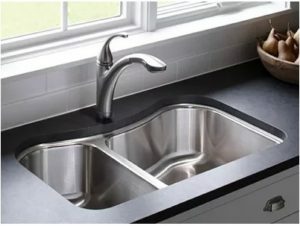 Pros: Many homeowners consider a curved sink easier to clean than one with square edges. Cons: If a sleek, minimalist look is your kitchen style, this might not be the look you’re after. Pros: This is a very durable, easy-to-clean material. Cons: The metal can scratch, but the marks can be buffed out of brushed stainless steel. 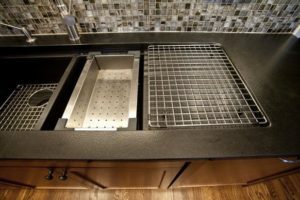 Most manufacturers offer bottom grids (wire trays that are placed in the bottom of the sink to prevent scratching). Also, if you live in a area with hard water, water spots can be a problem. Pros: This is a traditional material that looks authentic in kitchens with a vintage style. For people who love color, the choices are endless. Cons: Porcelain sinks can chip, leaving a black mark. Metal pans can also leave black marks or scuffs that are difficult to remove. Pros: Made of granite particles and polymers, this material resists scratches and chips. It does not show water spots. 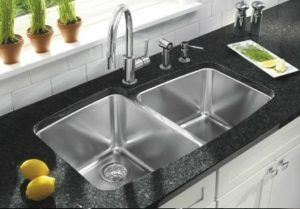 Cons: Lighter-colored granite composite sinks can stain, and some special maintenance is required. 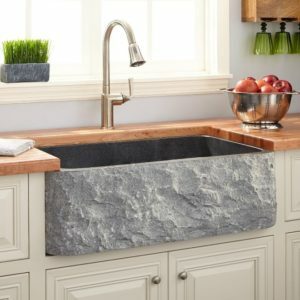 Pros: A natural stone sink — soapstone being the most common choice — can exactly match your countertop material and can give a kitchen an authentic period look. Cons: The material is costly, and it can scratch and chip. Special cleaning products may be required. Do you want accessories for your kitchen sink? 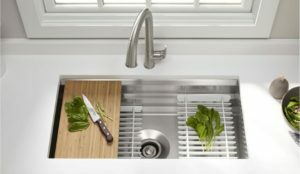 Pros: Sink manufacturers are making the sink work harder with myriad accessories built to perfectly fit on the lip of the basin. The choices include cutting boards, prep bowls, knife blocks, colanders and racks for dishcloths or cleaning utensils. These items can centralize and organize prep work. Cons: To achieve a perfect fit, it’s best to buy directly from the manufacturer.